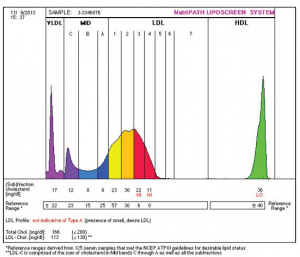 Liposcreen LDL-Subfractions Blood SST (Test Code 4028) – NutriPATH Integrative and Functional Pathology Services. Traditional lipid profiles do not identify the risk of cardiovascular diseases that are caused by the presence of small dense LDL and IDL particles. Dangerous LDL particles may hide behind normal cholesterol levels and, conversely, elevated cholesterol levels do not inevitably have to be associated with a heart attack risk.